Lightweight and compact Coated stainless steel for rust protection Hangs on hook or nail in the shed Encourage little ones to help around the garden with their very own tools. Many hands make light work! Made from rust-resistant coated stainless steel, the trowel is specially designe d for small hands with a shorter length and lighter weight. A great all-rounder for general digging, planting and weeding, the cheery red fi nish means it’ll always be easy to find among the greenery. Includes integrated hole for easy hanging in the shed. Measurements: W5cm x D2cm x L20cm Please note: any children’s tool should always be used under adult supervision. Position: full sun Soil: fertile, neutral to slightly acidic sandy loam As the name suggests, this is a superb variety that has been excelling on the show benches since Victorian times. Long, thick white stems are topped with mid-green leaves, producing tall, elegant and fine-flavoured plants which reach maturity early for an autumn crop. They are also very hardy, staying in good condition in the garden right into winter. Growing Instructions: Sow direct into shallow drills in a well-prepared seedbed in spring, and thin seedlings to 1cm apart. When seedlings are about pencil thickness, transplant to their final growing place, leaving 15cm between plants. For the longest white stems, dib a hole for each plant 15cm deep and drop the seedling in before filling the hole with water. If you’re growing for show, start your leeks in seed trays in a greenhouse in January to give them the longest possible season. 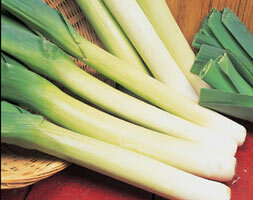 Sow: March-April Harvest: September-October Approximate quantity: 300 seeds. 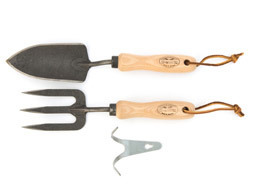 Compact tools for smaller hands Tough carbon steel and solid ash Lifetime guarantee Designed for gardeners with smaller hands, this compact trowel and fork set offe rs premium De Wit quality with more petite proportions. Made from hand-forged carbon steel and solid ash, the tools are every bit as rob ust as the larger versions but their shorter handles and blades give them maximu m manoeuvrability. 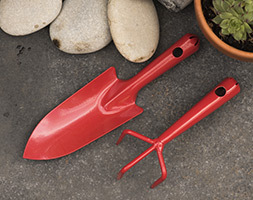 Both the trowel and fork have sharp bevelled blades to slice effortlessly throug h soil and roots, making light work of digging, turning, weeding and aerating. The set also comes with a free metal hook for easy storage. Measurements: Trowel length 30cm Fork length 28cm About De Wit tools The Dutch are renowned for making the world’s finest garden tools, and De Wit is the most respected name of all. Founded in 1898, the family-owned toolmaker com bines old-fashioned quality and craftsmanship with innovative design to create s uperior tools that last a lifetime. Every tool is hand-forged in the Netherlands from tough boron steel – shaped, sh arpened and burnished for durability, giving it the same blackened patina as tra ditional Edwardian tools. Each is fitted with an FSC-certified solid ash handle for ultimate strength and shock resistance, oiled to provide first-class protect ion against the elements. All De Wit tools come with a lifetime guarantee against manufacturing defects, m aking them a truly once in a lifetime purchase. 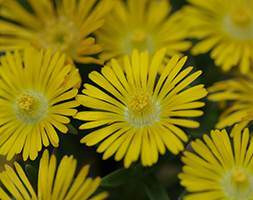 Position: full sun Soil: well-drained, sandy Rate of growth: average Flowering period: May to October Hardiness: fully hardy Plant this in a sun-drenched spot – either in a patio pot, alpine bed or border – and it will reward you with many months of sunny, daisy-like flowers. It makes great groundcover and is perfect for those difficult hot, dry spots where little else seems to grow. Garden care: Avoid overwatering – particularly in winter. 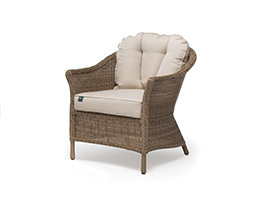 Pre-treated with a weather-resistant PU coating FSC-certified wood Comfortable and strong Ideal for having friends and family over on warm summer evenings, this Oban dini ng set makes a stylish and functional addition to your garden. Combining a generous rectangular table with two rattan benches, the set will com fortably seat up to 6 people perfect for barbecues, dinners and drinks. 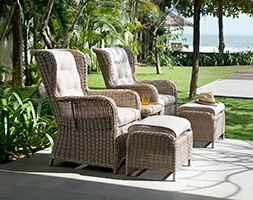 The benches have comfortable woven rattan seats and sturdy solid wood backs with carved circular detail. Side struts are fitted to the legs to give them extra s trength and stability. The versatile benches also make great statement pieces in their own right, and c an be used as standalone seating for the garden, deck or patio. Each piece in the set is crafted from FSC-certified acacia hardwood, known for i ts attractive grain. 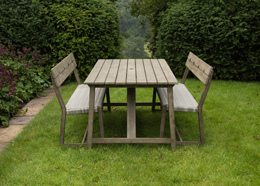 As a slow-growing wood it’s particularly strong, with a nat ural resistance to stains and odour, making it ideal for garden furniture. The set has been treated with a water-resistant weathered finish for an extra la yer of protection. It can be easily wiped clean with warm soapy water. Set includes: 1 x Oban dining table (H72.5 x W90 x L180cm) 2 x Oban rattan benches (H82.2 x W54.4 x L135cm) All items will be supplied part-assembled. Position: full sun Soil: well-drained soil Rate of growth: average Flowering period: May Hardiness: tender A 1/2 standard plant, with a 60cm tall clear stem and a 30cm head. This plant originates from warmer climates such as the Canary Islands, Morocco and Southern Europe, so it is not fully hardy here in the UK. It is however a wonderful and unusual plant for a conservatory. The aromatic, green leaflets will stay on the plant throughout the year and in spring or early summer it will start to flower. These are followed by rounded red fruit, which ripen to black. 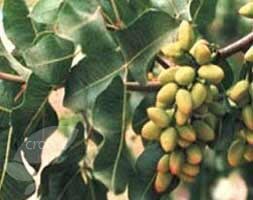 The sap of this plant yields a fragrant gum (mastic), which among other things is used in dentistry and medicine. Garden care: Grow in a pot on a sunny patio during the summer and move to a protected spot with a minimum temperature of 10°C during the winter. Water freely in summer, but keep on the dry side during the winter.